53-year-old female presented for compromised tissue flaps approximately 3 weeks after bilateral mastectomy. Four drains were placed at the time of surgery and 3 had been removed. 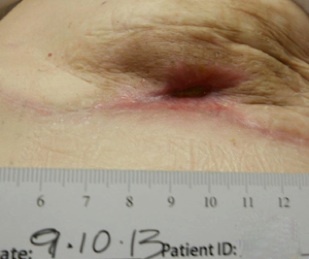 At presentation the patient had areas of tissue necrosis/ischemia at the left mastectomy site. Wound was debrided and seroma was drained. 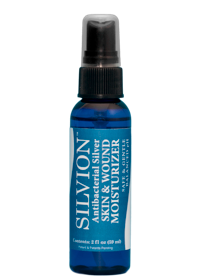 Patient was successfully managed with serial debridement, cleansing with Silvaklenz, flushing with Silvion and packing the wound with Silvion soaked gauze. Case courtesy of Dr. Belinda Marcus, M.D., FACEP, CWS - she is currently in practice as the Medical Director for North Fulton Hospital’s Hyperbaric and Wound Care Center. 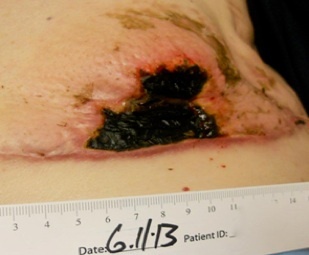 58-year-old female presented with a 2 month history of a compromised flap associated with post mastectomy reconstruction within the field of irradiated tissue. Post surgery, the patient underwent 18 weeks of chemotherapy and 33 radiation treatments ending 6 months before presentation. 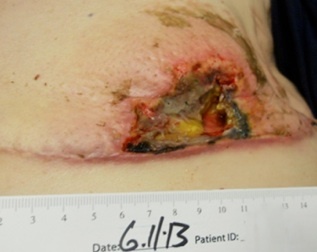 2 months before presentation, the patient underwent TRAM flap reconstruction which then failed with tissue breakdown, necrosis, and production of large amounts of malodorous drainage. Pseudomonas aeruginosa, Enterococcus faecalis and Staphylococcus aureus were isolated from the wound at presentation. 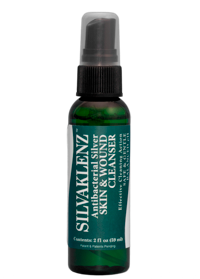 The patient was managed with serial debridement, IV abx, a wound VAC, cleaning the wound with Silvaklenz, flushing with Silvion and packing with Silvion soaked gauze. Case courtesy of Dr. Belinda Marcus, M.D., FACEP, CWS - she is currently in practice as the Medical Director for North Fulton Hospital’s Hyperbaric and Wound Care Center.